What Brand of gluten free flours and other ingredients do you use? For the ebook I used all Bob’s Redmill brand for my gluten free flours, xanthan gum, and gluten free oats. 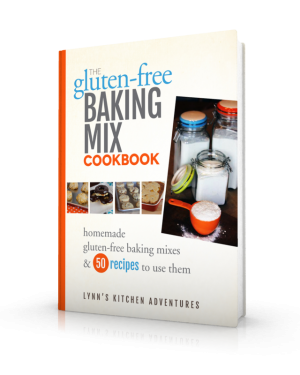 I also use Bob’s Red Mill brand in almost all of my gluten free recipes both on this site and on Lynn’s Kitchen Adventures. Can I replace the rice flour for another kind of flour? You can try, but I can’t guarantee the results. I spent a lot of time experimenting with the ratios and exact flours to get them right for the recipes. If you change up the flours or ratios it will probably change the results of the recipes. Can I use this mix in place of the store bought mix that comes in that bright yellow box? In my experiences the answer is sometimes and knowing when it will work is not always easier. I have found that in the majority of recipes the recipe did need adjusting with a different amount of liquid or an entirely different liquid. Cooking times also seem to vary as do the amount of eggs and other ingredients needed in the recipes. If you have a favorite recipe that you used to make, I say try it, but know that the results may not be quite the same.